Monterey Bay Aquarium’s blue whale art installation is presented by Monterey Bay Aquarium in partnership with the Golden Gate National Recreation Area (GGNRA), the Golden Gate National Parks Conservancy, Hub Strategy & Communication, Building 180, and lead artists Joel Dean Stockdill and Yustina Salnikova as a part of the Art in the Parks program. A life-sized, 82-foot blue whale art installation sculpture will be exhibited at the west end of Crissy Field from Saturday, October 13 to Sunday, March 17. Made from recycled plastic collected in California, the sculpture seeks to address the serious issue of plastic pollution threatening our oceans. Every nine minutes, 300,000 pounds (the approximate weight of a full-grown blue whale) of plastic and trash end up in the ocean*. The blue whale art installation helps us to visualize this impact, while at the same time celebrating the blue whale, an endangered species and the largest mammal to ever exist. The blue whale art installation makes its debut at Crissy Field, a place that has undergone many changes. Once a rich salt marsh and homeland of Ohlone people, it became a landing site for Spanish and Russian explorers, a venue for the Panama-Pacific International Exposition, and a United States military airfield. When the National Park Service assumed management of the Presidio in 1994 as a part of the GGNRA, Crissy Field was an unsightly, concrete wasteland. 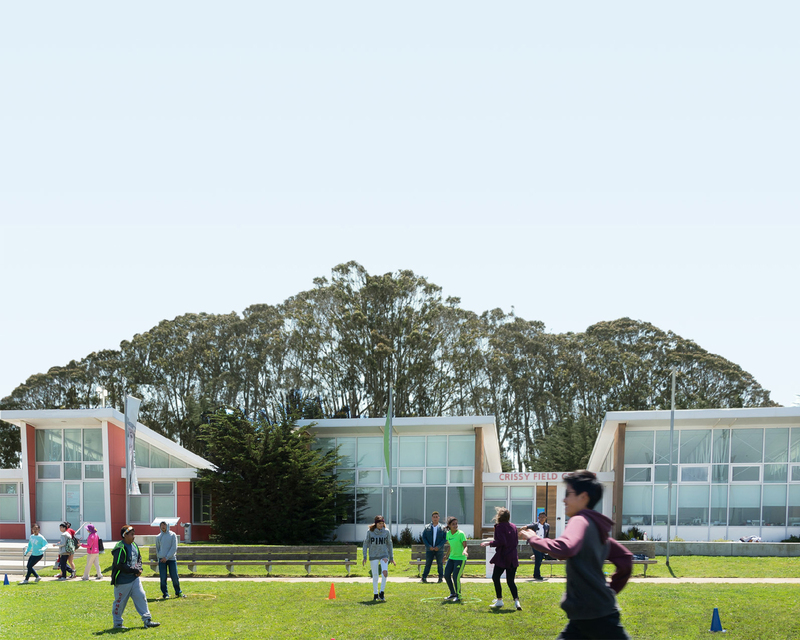 In 2001, Crissy Field was transformed into the park you see today. Part of the Golden Gate Biosphere, a diverse mix of terrestrial, coastal, and marine environments complemented by a rich cultural history, Crissy Field is the perfect place to think about ocean health. Artists Stockdill and Salnikova developed a custom by-hand recycling process for the exterior of the sculpture, demonstrating that small-scale, high impact waste management is possible. Products used in this process include laundry detergent bottles, milk jugs, and a lot of old and broken trash and recycle cans, as well as some shampoo bottles and juice containers. The result is a beautiful, colorful, and mosaic-like “skin” that brings the sculpture to life. This open-air exhibition, in a space that underwent dramatic restoration, challenges us to think bigger, get up close to the problem of ocean pollution, and imagine what needs to be changed to make our ocean waters a healthy environment for the wildlife that depend on it. To learn more about the project, please visit montereybayaquarium.org/plastics. *According to the National Geographic, 18 billion pounds of plastic enter the ocean every year. Broken down to minutes, that's over 34,000 pounds every minute, or 300,000 every 9 minutes. Where: The whale is located near the Greater Farallones National Marine Sanctuary Visitor Center on the Crissy Field Airfield. Parking: Recommended parking is at the Hamilton St. parking lot near the Warming Hut and West Bluff Picnic Area. Public transportation: Crissy Field is reachable via the PresidiGo shuttle and San Francisco Muni’s 28 bus. Check the PresidiGo and Muni sites for route info and times.